The Germans are always punctual and everything works perfectly in their country. Yes, with one exception: Deutsche Bahn (DB), the German railways operator, has been causing trouble forever. Once DB’s fast Inter City Express (ICE) trains are actually in motion, riding them is a lasting experience. There is nothing like racing down the tracks at 300 km/h (186 mph) and watching the world fly by. For trips of up to around 800 kilometers, nothing is faster than the ICE. If there was a race from the city of Bremen to Berlin, with one person on the ICE train and the other driving a Lamborghini Huracán, the first one would definitely win. He or she would have to change trains in Hanover, but still reach Berlin Central Station relaxed after 3 hours and 3 minutes. The person in that Lamborghini would cover those 396 kilometers (245 miles) in 3 hours and 46 minutes. By the time the driver would arrive in the capital’s city center, he or she would have burned a lot of rubber and fuel, and probably be close to a heart attack due to the stressful trip on the fast lane. All of the above applies when Deutsche Bahn actually lives up to its promises regarding punctuality, and if there is no ‘collateral damage’ on the tracks, but that is a different story, a sad one. The point here is: DB needs to improve. The passengers say so, DB’s boss Richard Lutz says so, and the government does. “Your mission, should you choose to accept it, is to make Deutsche Bahn great again”. This sentence, or a similar one, was probably what the government’s Deutsche Bahn pointman Enak Ferlemann heard when he was ordered to help. He is the James Bond they sent to save the world on tracks. A 007 without the booze or the women, but with determination. The other savior is Germany’s Minister of Transport, Andreas Scheuer (see main photograph). So, why does the government deal with punctuality and other issues? Why do they interfere? Why do they care at all? Well, first of all because Deutsche Bahn does not seem to be able to resolve its issues on its own. And secondly because the state owns 100 percent of DB. The government has to improve things in its own company. When Enak Ferlemann agreed to an interview with the Frankfurter Allgemeine Zeitung daily (FAZ) yesterday, he went there by train, of course. According to the publication, he was 30 minutes late because some signal tower had failed. The advantage is that the 007 of train tracks knows first hand what this is all about. “This shows the track system’s weaknesses”, Ferlemann was quoted saying by the FAZ. “This has to improve.” Well, yes. 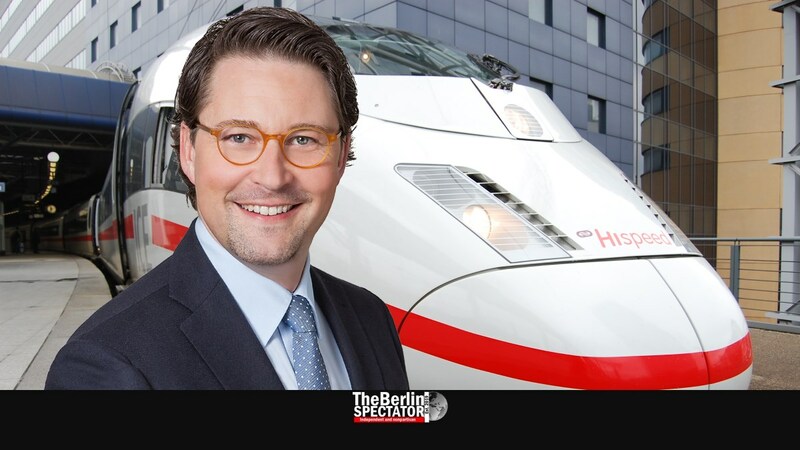 This coming week, Minister Scheuer, his pointman Ferlemann and the Deutsche Bahn board, including CEO Richard Lutz, will have yet another meeting at which they intend to analyze what exactly is wrong. Ferlemann already has a suggestion: In the FAZ interview he said he believed train tickets had to become more expensive. By that he mainly meant that special fares available, such as a ticket which takes the owner through the entire country for 19 Euro (21.66 U.S. Dollars or 16.41 Pounds), should be discontinued. “The times of cut-throat competition are over”, Ferlemann said. Passengers are not exactly happy about that advance. To the pointman’s opinion, the price war between Deutsche Bahn and the coach tour market is nearing its end, since bus operators are already increasing their ticket prices too. Until a few years ago, coach tours were forbidden within Germany, unless Berlin was either the origin or the destination. A law passed by the Nazis decades ago was supposed to protect Deutsche Bahn. It doesn’t anymore. Now DB is reacting to all the pressure they are getting from both customers and the government. The company intends to employ as many as 22,000 new people. This could be a step in the right direction. Ferlemann also demanded a digitization of the entire track network, with an estimated price tag of 1.5 billion Euro (1.7 billion U.S. Dollars or 1.3 billion GBP) per year until 2040. In the long term, he expects DB will be able to save money, after those huge investments were made. Sacking CEO Lutz is not an option the government intends to choose. Ferlemann stressed Deutsche Bahn had a “good CEO”, before he headed back to the train station for the next delay. Germany’s Federal Court of Audit is not happy with Deutsche Bahn either. Its punctuality problem almost looks harmless next to the 20 billion Euro in debt DB has, along with huge losses in their freight business. The upgraded menus in DB’s on-board restaurants have not made those issues go away. Deutsche Bahn says it is the second-largest transport company on the planet. They have 33.348 kilometers of train tracks. The distance their trains race up and down that network exceeds 700 million kilometers (435 million miles) per year, in spite of the private competition they now have. In 2016, Deutsche Bahn transported the unbelievable number of 4.4 billion passengers. Making the whole thing great again would satisfy many. Please check The Berlin Spectator‘s main page for more articles or features you might like. You can follow us on Twitter or on Facebook.